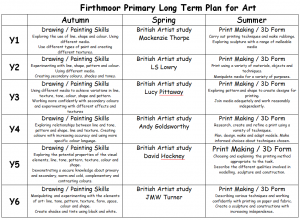 At Firthmoor Primary School, Art and Design is taught following objectives from the National Curriculum framework and is covered through either blocked or weekly lessons. Children are encouraged to produce creative work, to explore their ideas and record their experiences in a class or personal sketchbook. Throughout topics, they learn and develop their skills to become more proficient in drawing, painting, sculpture and other art, craft and design techniques. 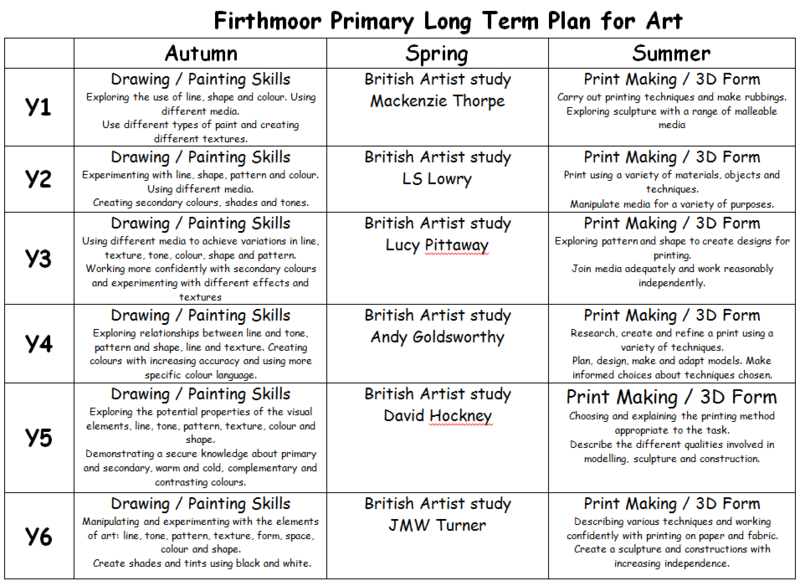 We encourage children to evaluate and analyse creative works using the appropriate art, craft and design vocabulary. Throughout Primary School, children will develop their knowledge of great artists, craft makers and designers, and have a greater understanding of the historical and cultural development of these art forms. We aim to engage, inspire and challenge pupils, equipping them with the knowledge and skills to experiment, invent and create their own works of art, craft and design. Children have access to a number of Art and Design texts to further their knowledge about the subject, and daily Topic Text sessions are often linked to the Art and Design topics being covered.